Tua-i tamakut tamaryukluki qanruyutet piyunaitukut. Cali piciugut maa-i. Kassaurcukluta qitevtelangata alarcaqunak. Man'a imarpik nuna-llu Kassaurngaitelliniuk. We cannot think that rules for right living are irrelevant today. They are still real. Don't think we are now kass'at [white people] because people are starting to speak English. Evidently, the ocean and land will always remain and never change and become like white people. Maa-i cat cimirluteng. Imumi naklegnarqellunritliniukut. Naklegnaqsukluta, iliini yuurqerkaunata, kaigassaagarluteng piaqluteng ilameggnek. Watua taugken ca amlleringami, tua-i wangni tangvallrenka naklegnaqluteng. Wii ukut wani qaneqcautelallrukenka, naklegnarqelriit-llu nallunguarluki pisqevkenaki, qang'a-llu kina imna ikayurkailnguq ikayuqerluku (pilaasqelluki), qang'a-ll' neqkarrarmek cikiqerluku. Nowadays things have changed. In those days we evidently weren't pitiful. Though we thought we were deprived, sometimes without tea, they'd ask their families for things they needed. Now it seems that though things are plentiful, we are so pitiful. I'd tell my children not to ignore a poor person who needs compassion and to help those in need or give a person a small amount of food. People in the past hunted and gathered, built houses, and crafted kayaks not merely to survive, but to express and affirm human relations and relations between humans and animals in a uniquely Yup'ik way. Relationships within families and communities and between humans and the world around them remain central. 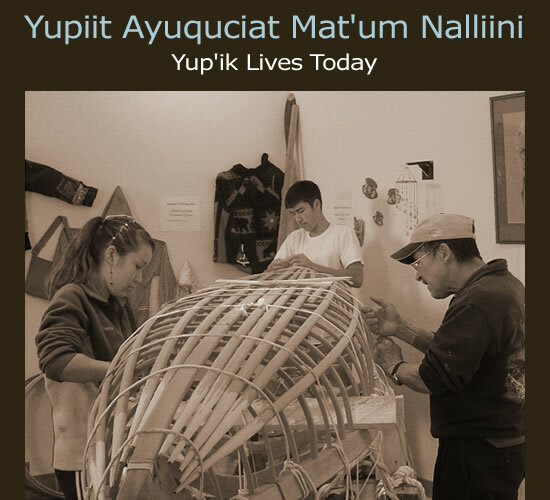 For many people modern technologies, so ubiquitous now, are simply new means to accomplish distinctly Yup'ik ends.